The top 8 teams go to the AFL Finals Series. Placement is determined by the standings points and, if points are the same between teams, the percentage is used. Points are determined by win-loss records (4 points for a win, 2 points for a draw, 0 points for a loss). The percentage is determined by dividing the Game Points Scored For by Game Points Scored Against. 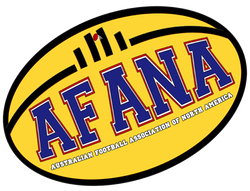 For a full explanation of the AFL Finals, see our FAQ.